This year rail fares rose by 3.6% - the biggest jump for five years.Campaigners have called on the government to freeze rail fares and use a different measure of inflation, the Consumer Prices Index, to determine rail fare increases. CPI does not take into account the cost of mortgage payments and tends to be lower than RPI. 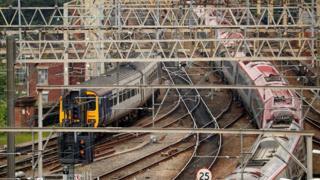 "I know the train's probably going to be late"
The Department for Transport said taxpayers subside the network by more than The fare rises will affect "anytime" and some off-peak fares, as well as season tickets in England and Wales. Some train users have already vented their anger on Twitter. Jean Thierry said: "A substantial service improvement is required to justify any sort of increase in fares." Another user said: "can someone explain to us why we have some of the highest train fares in Europe with poorer services?"